The move from Traditional to Adaptive Business Continuity (BC) may be uncomfortable for a number of reasons, but perhaps the most uncomfortable change concerns the general elimination of documentation as a deliverable. In stark contrast, the Adaptive BC approach focuses on recovery capabilities. The purpose of the Adaptive BC professional is the continuous improvement of recovery capabilities. We are not planning to plan; we are preparing to recover. Our craft ought not be be founded on our technical writing skills and Excel proficiencies, but on finding and implementing innovative solutions for organizational continuity. What are the capabilities that set the foundation of an Adaptive BC approach? At the summary level, they are the resources (things), procedures (actions), and competencies (personal fortitude) needed to recover services. Anything you do to enhance these capabilities enhances the organization’s recoverability. Setting up an off-site check printer, helping folks think through workaround options, and allowing staff to practice an off-hour relocation are all ways to improve capabilities — and none of these improvements involve documentation. Here, then, we encounter a potentially uncomfortable situation: If documents are not our main work products, what are? Capability improvements are our main deliverables. But then how do we demonstrate the value of our work? Measure improvements. Resources, procedures, and competencies can be measured. Set a “no-fault” baseline, work in short iterations to improve capabilities, measure the improvements, then report to leadership. Use dashboards. Roll-up your measurements into summary dashboards. Indicate improvements as well as gaps for remediation. Call out cost-savings and efficiencies. Use the dashboard as a heat-map and establish a roadmap for the next iteration of work. Tell stories. Create narratives about the improvements you have made — how they enhance daily productivity, further protect assets, build working relationships, and contribute to the overall mission of the organization. Deliver value. Every time you meet with participants, you must deliver some value to them within a context of BC. Whether your are helping them protect their bonuses, obtain additional equipment, enhance their flexibility, or just ensuring they have jobs to return to following an incident, the move away from documentation allows for a renewed focus on the actual people involved in potential recovery efforts. Rely on word of mouth. If you are truly Adaptive in your BC approach, word will get around that you are easy to work with, engaging in your meetings, and helpful to real people in real departments. These stories, your reputation, and your growing relationships will be a strong indication of the value your work brings to the organization. Help your executives sleep. Find out what worries them, and address it to the best of your program’s ability. Protect them from potential litigation, reputational damage, contractual penalties, and compliance fines. Win contracts and customers. Armed with data, stories, and reputation, use it to your advantage to secure additional business. Have potential customers take part in a preparedness session. Up the ante’ against competitors by making the contractual BC clauses more stringent in ways that only your organization can meet. Outperform the competition. If a significant incident actually occurs, your program’s focus on capabilities should allow your organization to recover faster than others. This gives you an opportunity to at least show comparative value of your efforts, if not actually capture additional (quantifiable) market share. A near-document-free BC program may take some getting used to. You will likely have to carefully set and manage leadership’s expectations. And you may feel that you are producing less. Yet the elimination of documentation leads to the freedom for innovation. No longer constrained by the need to create documentation at every turn, the Adaptive BC practitioner can focus on creative ways to parter with participants to improve capabilities and provide value to the organization. There may be a certain lightness to the practitioner’s new approach, but hopefully a lightness that will make the work worth doing again. 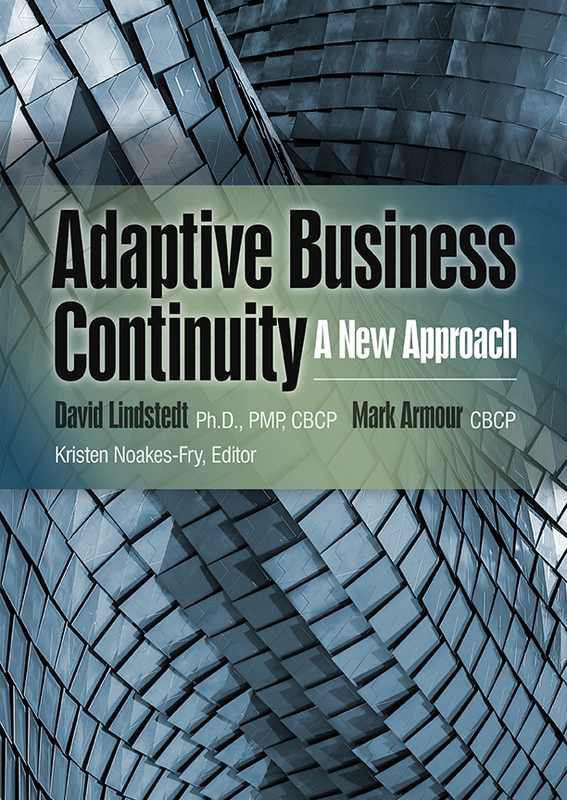 Dr. David Lindstedt is the founder of Adaptive BC Solutions and co-author of Adaptive Business Continuity.